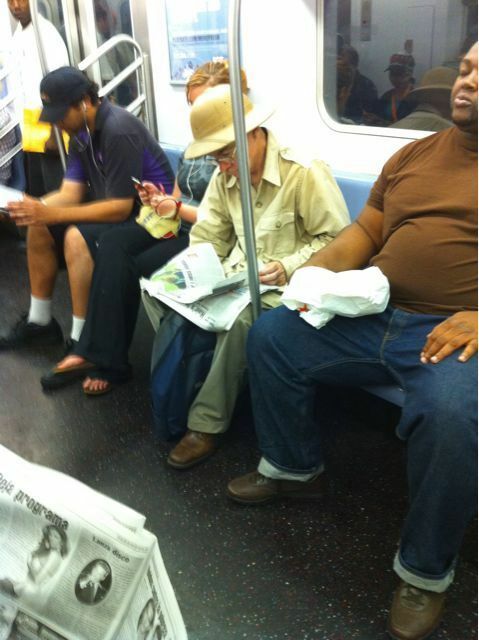 This man must have heard about the escaped elephant in the financial district so he got on his safari gear and headed downtown on the subway to resolve the situation. From all of the people in New York thank you safari-man, for saving us from all the savanna wildlife. ~ by chj48 on September 8, 2010. Thinking about safari man makes me smile. I think it looks like safari man and the guy next to him are on their way home from saving the city from the herd of Cape Buffalo. There was a celebratory BBQ of buffalo and big guy ate a lot!